…And home again. It was quite a trip. As I mentioned in my last post, I left home for Israel on the 19th of July. It was my third trip to this always fascinating, often beautiful and frequently infuriating land. The main purpose of my visit was to see my old school friend, Revital. We met at high school in Edinburgh forty years ago, when her father brought the family to live in Scotland while he studied at the university in the capital for his PhD. We’ve remained in touch ever since. they now live in a lovely self-built house in the north of Israel in Tivon near Haifa. My first visit was when I was nineteen – a long time ago – and my second was in 1993. In 1993 the Oslo Accord had just been signed and Revital’s husband was involved in its inception. It was a time of great hope in Israel. It looked as if a fair resolution had been reached that would allow Palestinians and Israelis to be equal partners in a new nation. Sadly, things did not turn out that way. The optimism is long gone. It was a very different Israel that I visited this time. Although I knew from news bulletins and reports that things had deteriorated, I quickly became aware that here in the UK we don’t get to hear the half of it. Revital, although she is an Israeli, is pro- Palestinian and deplores Israel’s actions against the Palestinians. She is actively involved in trying to get many more Israelis to become aware of these actions – carried out in their name. Her husband is Ilan Pappe, a well-known academic in the field of Middle Eastern history and politics. His pro-Palestinian views mean that, as an Israeli Jew, it became very difficult for him to maintain his position at Haifa University. He now works at Exeter University and spends a lot of his life on aeroplanes. It’s still a beautiful country. 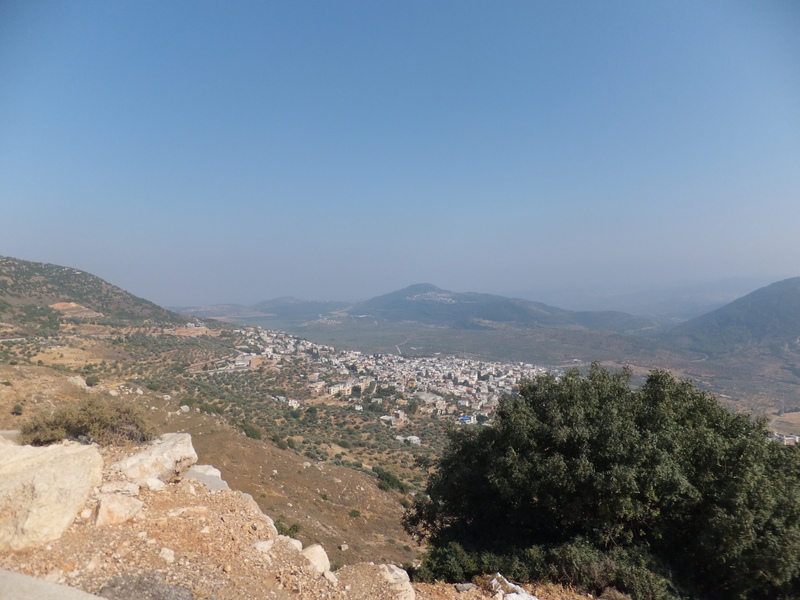 The Galilee is green and mountainous and its scenery gives Skye a good run for its money. Its desert landscapes are, to a visitor used to the lushness of Scotland, even more beautiful. But, oh – that Wall – or rather those walls. There’s the Wall around the West Bank – a monstrosity whose run includes Jerusalem. And there are also the walls – with only one point of entry/exit – that encircle and isolate two whole Palestinian towns of 100,000 people. 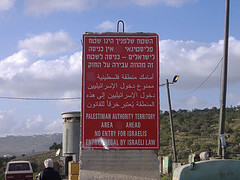 Both barriers are hidden in plain sight right beside the main Israeli north-south motorway. Ilan told me that most Israelis don’t even know these walled towns exist and therefore have no inkling of the misery caused by the restrictions placed on those townspeople. I have neither the knowledge, experience nor understanding of Middle Eastern politics to provide much enlightenment for those wanting to get to the roots of this conflict. I can only recommend that you read Ilan’s book ‘The History of Modern Palestine’ if you want a rigorous academic take. Or, if you want something ‘lighter’ but still insightful, then UK comedian, Mark Thomas’s, ‘Extreme Rambling’ is superb. Mark walked the length of the Wall. His account of his journey uses both humour and straight talking to highlight and spotlight some of the utter absurdities and cruelties of the Wall’s existence. Thomas’s book also bears out what Revital and Ilan told me about the land grabs that are going on as Israeli settlers lay claim to large areas of the West Bank. They are supported by the military who harass and bully the Palestinians and Bedouins off their land and out of their villages. 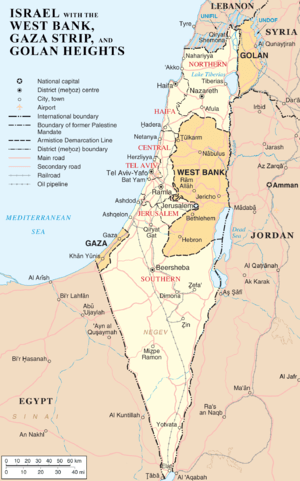 These Jewish settlements are able to divert water from the Arab farmers making their existence virtually impossible. Not only that, the Israeli military have also built whole new rnages of hills in order to make it more difficult for the Bedouin farmers to walk their animals to water and pasture! 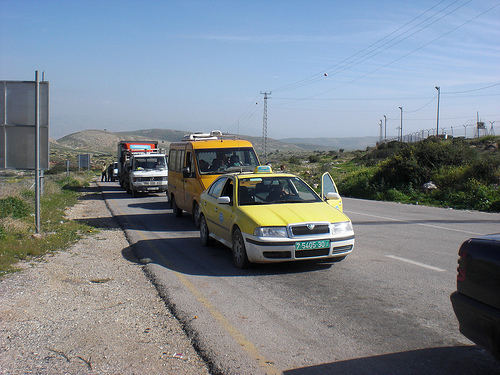 One day during my trip, I joined Revital and another friend of hers, Rocheleh Hayut, as part of Machsom Watch http://www.machsomwatch.org on a visit to two West Bank checkpoints in the Jordan Rift Valley. Machsom is a group of women who undertake to peacefully observe that human rights are respected at the checkpoints. Below is a slightly adapted version of Rocheleh’s account of our visit. 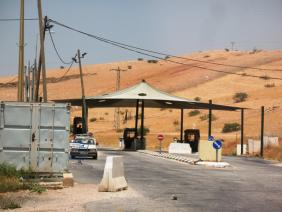 One of the Jordan Rift Valley checkpoints that prevent direct transit between the West Bank and the Jordan Valley, in addition to Tayasir Checkpoint. Located next to Hamra settlement, on Route 57 and the Allon Road. Report by Rocheleh Hayut; Translator: Charles K.
11.50 Hamra checkpoint – Hot!!! There’s a new netting above the position shading the soldiers and cars crossing east. The mobile scanner is in place. 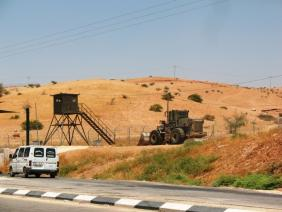 A huge bulldozer parks near the guard tower. After 12:00 labourers arrive from their jobs in the settlements, some in buses, others in vans and cars. All cross west without being delayed. 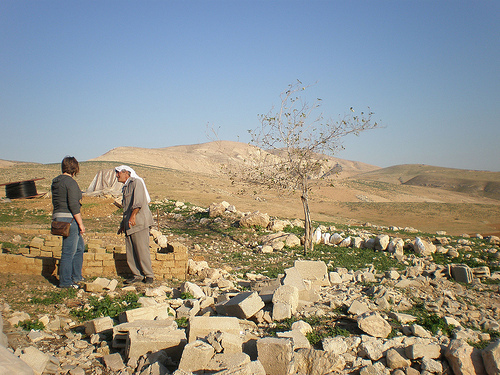 A resident of Farus Beit-Dajan told us about water wagons that had been confiscated from him, and asked us to help him. We called Jamila, who explained how they handle the issue of confiscated water wagons (which, of course, is complicated). Meanwhile the man continued on his way without leaving a phone number or letting us put him in touch with Jamila. Five or six huge trucks went through the checkpoint while we were there, each transporting a tank or something similar to a tank but without a turret. The long beam “oversees” the road. The gates are locked. Fields opposite the Ro’i settlement have been prepared for planting. They’re fenced, with rows of irrigation lines on their surface. Flags of the Kfir brigade fly from every pole: “Lions…Together Victorious.” Labourers returning from work here as well, crossing westward to the West Bank. A few people in taxis traveling east. We went up to the position. The commander – the First Sergeant who chased us away last time, insists now also. We promised to leave, since he has the power and the weapons, but told him we have permission in principle to stand next to the position. It’s obvious he wants to start a discussion. “Since the checkpoints were erected there haven’t been any attacks…that’s a fact!” They attack us because we’re Jews – why else? He teaches us what he said he learned in his high school geography (“I took the advanced geography course – 5 units) and history classes about the Jordan Valley: “It’s ours!!! It always has been, always will be.” As always, the discussion leads nowhere. It’s hard for the soldier, he’s young, he really knows only what he’s been taught. The discussion is quiet, respectful, it exposes him to a different point of view about the situation. The guard asks about the Machsom Watch badge, and raises the gate. It was a privilege to be given this opportunity to take part in the above observation and I thank Revital and Rocheleh for it. All the Palestinians who passed us waved in acknowledgement. Some stopped to talk. They all seemed stoical in their acceptance of this level of obstruction in their daily lives as they travel to and from work, hospital and family visits. But then they don’t exactly have a choice. When we met at the airport, the few years since I’d seen Revital and Ilan in Scotland fell away. It’s said that the sign of a true friendship is that even when the friends have been apart for a long time, they just take up where they left off – and that’s certainly what happened with us. We chatted away in the car from Tel Aviv to Haifa and the talking hardly ceased for the duration of my stay. Revital and I visited a friend of hers, Chagit, whom I’ve met on my previous two visits and who once visited me in Scotland. She lives in a beautiful house and we shared a delicious meal, cooked by Revital and Chagit while I ‘supervised’. It was also good to see Revital’s parents again. Revital’s mother told me that I now look very like my own mother – decided to take that as a compliment! We all had lunch together at a lovely restaurant near where they live. They have moved out of their former home in Jerusalem to a new place just outside the city. Life in this once sublimely beautiful city is very different with that bloody great wall dividing it in two. But it was good to glimpse the old city in passing and see the sun glinting of the golden dome of the Al-Aqsa Mosque. Later the same day we visited Revital’s brother and his family. What a lovely man he is! We last saw each other when we were teenagers so there was a lot to catch up on. I saw Haifa by night, looking down on the German quarter and the Mediterranean from the high vantage point at the Bahai gardens. I visited the upper Galilee and attended an open evening at a new kindergarten for both Jewish and Arab children. I visited the home of an Arab woman whom Revital knows. Despite it being Ramadan and therefore a time of fasting, Sharma gave Revital and me cold drinks and the most wonderful chocolate cake I’ve ever tasted –whilst abstaining herself. Sharma’s eight-year-old son, Mohammed, looked at me as if I was from Mars – this fair-haired, fair-skinned grandmother from a place he’d never heard of. But while his mum and Revital were talking in the kitchen, and Mohammed and I were left alone in the living room, he begun to sing quietly to himself whilst glancing at me from time to time. I recognised the tune – Head, Shoulders, Knees and Toes. 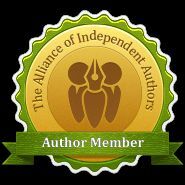 Gradually he switched from Arabic to English – tentatively singing the words and doing the actions. I smiled and gave him the thumbs up and when he got a bit muddled, I sang the correct version. I was rewarded with the biggest smile. He then moved on to asking me my name and where I was from and responded to my reciprocal questions. He seemed quite spellbound that this subject, i.e. English, that he’s learning in school actually works. It was a magic little encounter. And in amongst all the serious stuff Revital and I found plenty time to enjoy each other’s company. Sometimes we walked the dogs together or went to the shops. We saw a photography exhibition, and an art exhibition and popped in at the circus school run by a friend of hers. We talked till after midnight on most evenings – plenty reminiscing and laughing – as well as discussing our work and family lives and thought and dilemmas about the future. Revital is of course concerned about her elder son’s imminent call up for national service – something I’m glad I haven’t had to face up to. All too soon it was time to come home. Revital and Ilan took me back to the airport and accompanied me through the first part of security. And then it was back to an impossibly busy Heathrow and from there to Edinburgh for the night. The following day I travelled home to Skye. I was sad to leave but also glad to come home. Home to where the temperature – in weather, political and emotional terms is altogether cooler. Revital suggested that for our 60th birthdays we should go to the, Michelin starred and very famous, ‘Three Chimneys’ restaurant here on Skye. That will be in four years time –so plenty time to save up –it’s an expensive place. Plenty time too, surely, for things to improve in the fascinating, complex and infuriating country of Israel. Time perhaps for the Israelis to cease looking inwards and seeing themselves as victims. Time to develop a more confident, outward-looking view that can embrace all the citizens of Israel-Palestine in a nation of mutually respectful citizens. I hope so. Welcome home! What a lovely blogpost, so interesting. Israel has a very sad past I really hope they will have a much happier future. Your holiday with your friend sounds lovely true friendship when the years just melt away. I’ll just be a year behind you for the big 60 and I can’t believe it’s not that far away. Oh dear! I’d love to visit Jerusalem and Bethlehem but not until I know it’s really safe.